First, what a astonishing destiny for Marshal Pétain! To have risen so high and fallen so low! In the long history of France, other great personages were admired, but surely none was loved more before being denigrated so much. His misfortune was to inherit not only a defeat in which he played no part, but also a people, once great, that had fallen terribly low. Yet, he never gave up on his people. Even at his worst moments, Pétain could not have thought that. He was born in 1856 to a peasant family in Picardy, under the reign of Napoleon III, before the automobile and electricity. Three times, he saw his fatherland invaded, in 1870, in 1914, and in 1940. The first time, he was a teenager, and his dream of revenge made him a soldier. In 1914, he was 58 years old. His independence of mind had put the general’s stars out of reach. A mere colonel, he prepared to retire. The assassination of an Austrian archduke in Sarajevo and the conflagration of Europe decided otherwise. In the crucible, he was suddenly revealed. 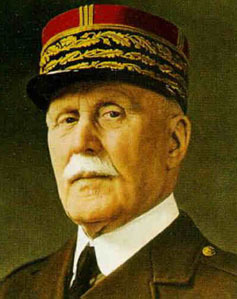 Four years later, he was that commander and chief of the victorious French Armies of 1918 and received the baton of Marshal of France. Of all the great leaders of this atrocious war, he was the only one loved by the soldiers. Unlike so many of his peers, he did not see his men as raw material. The victor of Verdun was one of the few who understood there is no point in winning if one’s own country is bled to death. There are many explanations of the defeat of 1940, but for the old Marshal, one of the main causes was in the appalling bloodletting of 1914 to 1918. The holocaust of a million and half of young men had killed the energy of a whole people. Thus the first priority was to keep these people as safe as possible from another slaughter. At the same time, Pétain hoped for a future renaissance through a “national revolution.” He has been attacked for that. Admittedly, all would be mortgaged by the Occupation. But really he had no choice. The “national revolution” was not premeditated. With all its ambiguities, it emerged spontaneously as a necessary remedy to the evils of the previous regime. Today, in the safety and the comfort of a society at peace, it is easy to pass categorical judgments on the men of this that time. But those brutal, pitiless days could not be appeased by moral petitions. At every moment, they required decisions with cruel consequences that could lead to, as so often in times of war, to saving some lives by sacrificing others. For those who did not assume the responsibility of government, it was permissible to take another side and symbolically raise the challenge of arms. And it is salubrious that some brave men made this choice. But what does that take away of the nobility to the sacrificial resolution of Marshal Pétain? General De Gaulle’s adversaries try to minimize the scope and nobility of his own gesture, the call to open resistance. They point out that the Marshal’s former protégé had not jumped into the adventure without a parachute. They add that facing the Germans from London, behind a microphone, was less perilous than doing so in France in dramatic, unequal, daily interactions. Perhaps. But, parachute or not, the General’s choice to rebel was of rare audacity. The fruit of an unrestrained ambition, his detractors reply. Surely. But what can one accomplish without ambition? This type of ambition, however, was lacking in Marshal Pétain. At the age of 84, with his record, he had nothing more to prove and everything to lose. If our time were less intoxicated with petty politics and base resentments, we would have long ago celebrated the complementarity of two men who redeemed, each in his own fashion, that which is small, vile, and abject in our times. 1. Georges Pompidou, Pour rétablir une vérité (Paris: Flammarion, 1982), p. 128. 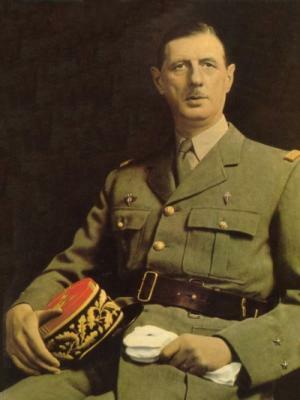 Published: November 12, 2010 | This entry was posted in North American New Right and tagged articles, Charles De Gaulle, Dominique Venner, France, Johnson translation, North American New Right, originals, Philippe Pétain, translations, World War I, World War II. Both comments and trackbacks are currently closed.